Situated in a picturesque valley, surrounded by Southern Utah’s trademark red, sandstone cliffs, you’ll discover the beauty of St. George, UT. Settlers founded St. George in 1861, and the town has been growing and expanding ever since. Its mild winters, year round golf courses, and access to one of the most beautiful National Parks, Zions National Park, has made St. George a landing spot for many people. 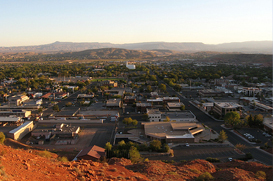 St. George is well known for its activities and attractions in the area. You are minutes from some of the best rock climbing in Utah, nationally recognized golf courses, and popular hiking trails. If you are looking for entertainment, look no further than St. George’s outdoor theater, Tuachan. Tuachan features two major broadway productions each summer and hosts numerous well-known performers throughout the year such as America, Brian Regan, LeAnn Rimes, Wayne Newton, and many more. You can always find something to do when living in St. George. Are you looking for an athletic outlet? St. George is your host for the Huntsman Senior games and the Iron Man marathon. These rigorous activities are a thrill for those participating as well as those spectating. St. George also features its own marathon in October and a handful of other half marathons throughout the year. The health care offered in St. George is some of the best in the entire state of Utah. Intermountain Health Care has the facilities to support any type of illness or injury. You will be in good hands as you visit the Heart & Stroke Unit, Newborn Intensive Care Unit, Huntsman-Intermountain Cancer Center, or the Dixie Regional Health & Performance center. St. George’s theme is “where the summer sun spends the winter,” and it is all too true. If you like clear, blue, sunny skies, speckled with white fluffy clouds, red rock mountains, vibrant golf courses, famous hiking trails, great shopping, and sunny days than St. George is the place for you. You need an experienced real estate agent to help you through the home buying process. We know and love the St. George area and are eager to share our enthusiasm with you. Call us today to learn more or to schedule an appointment.